Is your deck looking a little rough around the edges after the snow and ice of winter? It’s probably time for a new deck! Is your deck looking a little rough around the edges after the snow and ice of winter? When you search for a rail to put your drink down, do you find that everything is a little wobbly? Last but not least, are there so many cracks and rusty nails you need a tetanus shot before enjoying a book on the deck? It’s probably time for a new deck! Here are some of the signs that your home needs a brand new deck. The best starting point for a new deck is examining the state of your current deck material. Every type of material shows wear differently, so pay attention to what your deck is actually composed of. 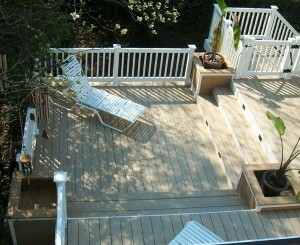 Real wood decks commonly suffer from insect infestations and warping. Composite or vinyl decks typically have problems with fading. The posts underneath your deck often become magnets for water looking for somewhere to go in your yard. If you need a new deck, it might be because of what’s below instead of what’s above. If there are posts holding up your deck that are suffering from rot or water damage, the safest thing to do is replace them altogether. If you only have one or two posts with the problem, you can safely replace them. However, if you have all of your posts showing signs of rot, it’s time for an entirely new deck. Joists are what keep the deck off of the ground, so they are particularly important when it comes to keeping your deck structurally safe to occupy. If the joists on your deck are soft or showing any signs of rot, it is a very bad sign for your deck. Joists are very tricky to replace without replacing your deck as a whole, so damaged or rotting joists often mean a new deck is necessary. Ready for the Wood Deck of Your Dreams?